Do you ever come off the pitch thinking that you’ve lost a game you should have won – just because you weren’t organised enough? Whether you’re playing 7-a-side yourself or coaching one of the many kids teams playing the 7-a-side game, it’s important to have a clear idea of your playing tactics. As with all forms of football, having good individual players is only part of the formula for success. The other key ingredient is having a clear idea about the way you’re playing; a framework to get the most out of those individuals. Below you’ll find a range of formations that your team can try out to bring that much-needed organisation and winning-structure to your games. Things work best when there is a natural balance to the team. If your 6 outfield players all think they are attackers then you’re going to have major difficulty beating any decent opposition. It’s the same if all 6 of your players are stuck defending. Your objective should be to achieve enough balance between attack and defence, left and right sides. I wish I could give you one single formation that will work for every team. Sadly that doesn’t exist because each team is made up of different individuals and you need to find a way of playing that plays to their unique talents the best. Maybe your side has a couple of players who can easily cover distances at pace – you might consider playing with wingers. Maybe you’ve got two excellent strikers that can form an effective partnership – your challenge might be to arrange a team to best support them. There’s no right on wrong answer when it comes to formations. In a lot of cases it will be worth trying a couple of different systems before landing on the one or two that work best for your group. And remember, whether you’re a group of adults or coaching this to a bunch of kids, systems take time and patience for players to understand their roles so don’t necessarily expect instant success. This has got to be one of the most popular formations. It’s heavy on midfielders who are expected to help out the defense as well as getting forward to support the attack. Because of its mix of defensive cover with attacking potential, it’s one of the most commonly used tactics. + Midfielders can help bolster the defense when needed, as well as support the attack, making this a dynamic formation. + Provides width from the left and right midfielders. It’s especially good if they have the pace and stamina to both support attacks and help with defense. – Places a lot of demands on the midfielders, whose versatility is key to making this work. – Risk that only two players are back defending if midfield do not have the discipline to track back. Very much like the 2-3-1, but this formation purposely splits the midfield into two attacking midfielders and a more defensive midfielder. Of course all of the midfielders are expected to play a part in attacking and defending, but this formation allocates more of a mix between the team: 3 of the team are more attacking, and 3 are more defending. This is excellent if your defensive midfielder is a good ball-player who can set up attacks as well as cover the defense. Perhaps you’re more attack-minded and you want to use a 1-1-3-1. This formation keeps one player well back to deal with the attacking threat, whilst the midfielders push forward as a group, keeping a defensive midfielder in a deeper position to support the defender if needed. Not the most popular formation, but one that is used by more attacking teams. + Focuses on attacking play – useful where a team expects to dominate the game. + Loads the midfield area with players. – The lone defender will need to be very competent (and fast if possible) as defensive support is limited. A more defensive strategy. With three at the back this provides a solid foundation to build forward from. It isn’t supposed to be an entirely defensive strategy though. It can be made to be an attacking formation by pushing the full-backs on for attacks, or pushing the central defender into midfield on the attack (see ‘combinations’ below). Other possible formations, but ones that don’t seem to be in common use are the 2-2-2 and the 1-4-1. In theory they are both perfectly balanced between attack and defense but neither of them seems to have caught on in popular usage. The 2-2-2, appears not to provide much structured width, instead relying on the forward attacking players making the wide runs. But this could still be effective where players have enough positional discipline to make runs either forward or wide, and for other players to cover appropriately for them. The 1-4-1 is an extension of that principle. If you have good enough players that can join in with the attack and the defense, and have the discipline to do both then then using 4 midfielders who switch between these tasks could be a viable option. Potentially, this provides the most flexibility and dynamism of all of the formations, although I suspect it will feel too unstructured for most. The chances are that your 7 players are not going to move around the pitch the whole time in the above set formations. Players will get dragged out of position, need to help cover other areas of the pitch, and may find it useful to adopt different positions when attacking to add the element of surprise. So don’t make your formations too inflexible. In a small-sided formation, it’s often more sensible to talk about using at least two different tactics. Don’t over complicate this, especially if you’re working with kids (no 10 year old is going to want a vast playbook of tactics), try to limit yourself to talking about two simple shapes: one that you use when defending and another for attacking. This illustrates how a team might employ a more defensive formation in defense and adapt it to be more attacking when it is going forward. Here, when a team is defending, they play 3 at the back with two midfielders sitting in central positions. However, when defense turns into attack, the two midfielders go forward and wide to provide attacking options, whilst the central defender moves forward into midfield as a holding player. If you’ve got a strong, tactically aware, ball-player in that defensive position then this can be a very effective formation. Here’s another illustration of how two formations can be blended. Whilst a 4-1-1 formation would be far too defensive for most teams to use for an entire match, this could be the shape that you want your players to take up when you’re defending deep in your own half. As soon as you’re on the attack, your wide players could then begin moving forward to support the attacking effort, making it an effective 2-1-3. Your midfielder would also push on, leaving your two core defenders ready to deal with any attacking threat. Of course this requires very mobile full-backs/ wingers, but can be effective with the right players. 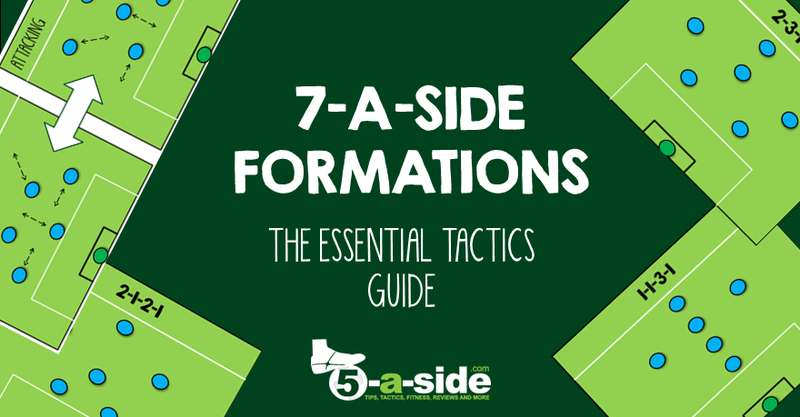 Even though 7-a-side only has 6 outfield players, there are a lot of possibilities over how to set up your formation and tactics. There’s no one single solution; each team is likely to have their own specific needs depending on the abilities and understanding of the players. Getting things exactly right is going to take a lot of trial and error, as well as patience, but the benefits should quickly show when your team finally understand the system. What formation works for you and your team? Which formation is most difficult for your team to play against? What extra tips and tactics help you and your team get a winning edge? My U11’s set up in a 2-3-1 formation and my wingers are encouraged to track the runs of their midfielders but to push on when we have possession. I ask them to drive forward and find a cross with the opposite winger hitting the far post. If we are dominating or chasing a game at times I have switched to a 1-3-2 and what happens is one of my defenders pushes into midfield when we gain possession, pushing one of my midfielders up front to play as a 2. When we lose the ball they all drop back into their normal positions. I am lucky as I have some technically able lads who are also fit so can cope with the demands of this system. Hi Robert, thanks for sharing details about the formations that have been working for you. It’s great when we can all learn off each other! Need help. I’ve coached 7 v 7 for years using a 2-3-1 first and lately a 2-1-2-1 or even a 1-2-2-1. We’ve won our championship 5 out of the last 6 years. We are U16 level now. The past two years a team has beaten us twice. They use a high pressing 3-1-2 which is almost a 3-3 because of how high they play their back line. Their keeper sweeps and their best player is their center back who is 6’ 3” and as fast as anyone on the field. Last season we lost 5-2 and we won 5-0. We lost 3-1 this season and have one more game vs them upcoming. I’m looking for a counter formation or system to beat this high pressure 3-1-2. Their two Strikers are above average but not remarkable. The center-mid is scrappy but not too great. Their back 3 are tremendously mobile and big. We have 1 very gifted Center-Mid, 1 big holdup style Striker who scores a lot of goals, 3 Ronaldo type iso wingers who don’t pass but have pace and skill and a bunch of above average backs. Our keeper is a very good ball stopper and has the most pace of anyone on the team. Our weakness may be depth at central midfield. This does sound like a tricky one, but here’s a thought. If they have one outstanding player in the base of defence then how about trying to move him about a bit more. I’m thinking that you perhaps play a 2-3-1 against this team. Your striker should could try to draw the defenders about a lot and then you could try to use the 3 midfield runners to get into the space that the striker is hopefully leaving for them as he tries to pull the defence about a little. The wide midfielders could try to make sure that you keep the defenders stretched by giving as much width as possible, hopefully opening it up for the others to make runs in to the spaces that are left. I am a brand new coach. I have never coach nor watched a soccer game. How many different formation should I have? I was thinking about starting out with 4 then keep what works as the season goes on. Hi Coach. Hopefully you’ve settled into a groove by now. My advice would be just start with 1 and then play with variations of it as the season goes on and you work out what will complement the players the most as you go. If you’re playing with younger age groups, you don’t need lots of tactics. It’s all about helping them learn the various positions within the system, and letting them have a go at several of them. It’s a learning experience for you all. Good luck! Thanks for all of your time replying to these comments, very helpful! I’m trying, in the short amount of time I have to give them something SUPER EASY to understand. Most still chase the ball like a swarm of bees, similar to my 6 old daughter. Last week, I tried a 3-3, three guys back & 3 guys forward (that seems super simple to understand). I found that it worked okay (something is better than nothing I suppose). I’ve already separated on paper which kids seem to be more natural patient mid fielders and which ones are attackers. I think tonight we try 3-2-1, what is recommended at the most BASIC LEVEL? Final question: what are the top 3 things to emphasize for the duration of the season to give these kids the best chance of enjoying the game without lengthy explanations? Currently I’m focusing on 1) moving the ball up the sides, 2) teaching the goalie to PICK UP the ball (throw, kick or roll –> they’ve never been taught what a goalie can do), supporting each other on the field and then returning to their position as needed. My son Thomas had trials a few months ago and has got into a different team playing in the top tier of the county under 11s league , the coaching is poles apart and he is really enjoying himself and I feel your advice and feedback has really helped in him achieving this. He is playing left wing / wing back or left back and enjoys all these positions and he really enjoys using the width when pushing up so any advice on getting the best out of these wide positions ? I think the coach is looking ahead to the team playing 11 a side ( they are currently playing 9 a side ) he does seem to get a little isolated out wide and the team do not seem to use the wide areas as much as I think they should but hey its not me coaching the team ! so should my son come to the ball a bit more loosing width or stay wide and provide width ? Hi Robert, it has been a while since you posted this – how’s your son getting on now. Good quality coaching can make a world of difference! I’m glad if I helped in any small way, but credit goes to you for creating the right environment for him. It’s difficult if the coach has a set idea and he desperately wants width, but really if that means your son is just out on the touchline not getting involved enough then I don’t think there is any harm in having the occasional foray in field! Hopefully over time, it will become clear to him when he’s best staying wide to create space for the team, and when he’s better dropping in to take the ball. A false 9 is a level of complexity that hasn’t been raised yet. But sure, it’s something that could work if you have the players for that system. Good luck! I coach an U11 Girls team and we play a 312. Luckily, I have a handful of really quick, strong girls that can play as wingbacks, bombing up the wings and giving us loads of width to pull defences open. You need a mobile Centre Back who is good at delaying and deflecting play. Also needs to be vocal and direct her wingbacks to come and help. Central Midfield tends to stick to the centre circle and just mop up there. When they do get the ball, they should have two forward passes, and two wide passes on. If you have a pair of forwards who play well together, they’ll fill their boots if the wingbacks can get the balls in. Even better if you have a target and a nippy player to play off them. Sorry, another thing I wouldn’t mind other peoples opinion on….we currently play 3-2-1, the striker plays high up the pitch and is encouraged to stay there by the manager (i’m the assistant). It looks to me like he should drop into midfield a little to get involved, not too far but just a bit. Any thoughts? And similar for the defenders, but the opposite, they are encouraged to stay back when were in possession, which is good because then we’ve always got defensive cover but then when we do get the ball in the opponents half we’re always outnumbered and the attack rarely comes to anything. Hi Sam, it’s a matter of personal preference. The thing with tactics, though is to try different things, see what works then adjust some more and so on. So, I’d say it’s definitely worth giving your suggestions a go. If, after giving those ideas a chance, they don’t work then at least you know. It can be difficult if you’re the assistant manager. The manager is ultimately the one who should be calling the shots, but if you’ve got a good relationship with him then he should be listening to your ideas. Try to approach the subject in a friendly, helpful way. I coach a 7 a side under 9’s team that really struggle at the moment. I’m not too worried as we are a new team this season with most of the players not been involved in a team before so they all have lots to learn. However, any advice would be welcome. We adopted a 2-3-1 formation at the start of the season but moved to a 3-2-1 as we were conceding lots of goals and not scoring any or even getting the ball forward. 3-2-1 now definitely gives us a more robust defence and we now don’t leak as many goals but a) struggle to get the midfielders back to defend, and b) also still struggle to get the ball forward. We have a variety of players, some good, some inexperienced, good tacklers, and players with pace, and physically strong players. So definitely a lot to work with. Any words of wisdom would be appreciated. Or have the central defender push on and support the midfield and have the other 2 defenders hold the fort? And then when defending…should the 2 midfielders come back and defend in wide positions or to sit in front of the defenders? And then lastly, from goal kick, if we play a short pass, play it out to the wings? Or just get the goalie to do a big kick? Hope this doesn’t sound like a cop out, but I do think that patience is the key with this team. If they’re inexperienced then it will come and I don’t think there’s one particular answer that will be right for them. The thing I would say, if they’re generally inexperienced with football is that developing technique and basic skills is WAY more important than anything you can do with them tactically. You need to give them the basic patterns of passing, retaining the ball and defensive technique. With those, they’ll be able to fit any formation you want to put them in. Specifically on your question, if your RD or LD have pace and stamina then it might be worth pushing them on when attacking – they will have fun doing that anyway. I would have my midfielders come in and defend more centrally when defending, but that’s personal preference. Good luck! I am a keeper on a men’s 7. I find that our defensive formation is best as a fluid man to man situation that changes each time the ball is back in play with keeper calling a counter play. Example…player D1 go tight on A2 stay on him…or D2 Go to the ball, or drop left…etc…the attackers we play are constantly running plays, criscrosses etc…and only by calling defensive counters do we stop the always different attacks …center back is often high to control the middle. Speed is all, and often men are purposefully left open if in less dangerous to apply more pressure on others. I’ve played the tactic of 3-2-1. playing both the defenders going towards wing and then comes a cross. A really nice tactic. My son has played three 9 a side games and one mini tournament and progressed well from 7 a side so far and its going ok . He has scored one goal and pretty much put several goals on a plate for his team mates with great crosses from the left wing position . We have been playing a loose 3 4 1 and are lucky to have two players playing wide that are comfortable and confident in the space on the wings , the defence soak up pressure well and are pretty solid but we do concede goals on the break and its pretty obvious that the midfield is playing too attacking at times so any advice on gently coaching the attack / defend mind set ? Also the boys seem comfortable and confident in their positions and the team pretty much picks itself and they all play well in their current positions . As you have mentioned previously its healthy to play the boys in different positions but they all seem happy as they are and know the position and responsibilitys of the position well so any advice on the boys playing different positions without upsetting the balance and dynamics of the team ? . Thanks and always enjoy reading your advice and feedback . Hi Robert, getting the right balance between attack and defense is really tricky. It’s hard for kids to have the awareness to be thinking about defensive cover when there’s exciting attacking action going on. Perhaps some training games that focus on reacting at the moment of ‘transition’ (ie. when you lose the ball) would be good. Not only will it help them react when the ball is lost, but it will also help them think about how they might be overcommiting. As to rotating players, I’d take the slightly radical view that you should go ahead and just do it without worrying too much about upsetting the balance. Those who do rotate the team like this are probably likely to do so at the expense of results, but it should be in the long-term interest of the players to do it. If you’re worried, and players are particularly stuck in their positions, why not try doing little-by-little, like swapping players round near the end of games when you’re winning. Hi , don’t want to make a nuisance of myself !! thanks for you feedback and advice regarding my son and the junior 7s team he plays for . Since being given more freedom to push up and express himself more he has been playing in a winger / wing back role and his confidence has really improved and has really grown into the role making great runs on the left wings and putting in some very good quality crosses and cut back balls , pretty much making a real head ach for the other team ! !, however he still has that defensive mindset and seems to get a bit stuck between defending and pushing up supporting the attack . Its a different role he is playing and I am confident he will grow into it as time goes on . Is it a question of my son reading the game more or the coach being a little bit more specific in the job he wants the boys to do in the game or game plan / opposition ? . He has got a few tournaments coming up over the next month that he is looking forward to some 7 aside and some 9 aside ( he will be playing 9aside next season ) any advice regarding the attack / defence question greatly appreciated !! and thanks again for the feed back and advice . Hi Rob, no problem with these questions. Good to get the debate going. It’s good that your son’s confidence has been improving with his increased license to go forward. In terms of him developing and understanding between attack and defense, this is quite difficult. He’s still very young, so I don’t think too much can be expected of him too quickly – there are lots of adult players who don’t understand the right balance! I would say that if you or another coach thinks the balance is perhaps wrong then you could help him with it. I wouldn’t do it in a way that just simply tells him what to do, but I’d give him some thoughts and questions so that he can think about it for himself. It’s very difficult to achieve a perfect balance and just make sure that if he gets it wrong a few times he isn’t hammered for it – those are the moments we should learn from. Also, going forward does naturally entail taking some risk, so occasionally the other team might exploit this. It’s all part of figuring out what’s best for him and the team. Hi you gave some advice regarding my son paying in a junior 7s team , the coach has had a shift round with team shape and positions , the last game set up was a loose 2 3 1 and it worked very well , my son playing left back pushed up really well when in possession and gave width and options for the midfield players and picked up cleared loose balls from just outside the box , we have a big lad playing centre mid who is a great target player and holds the ball up really well and a fast centre forward playing up on his own getting good service from the midfielders because the midfield is strong playing the 3 , its looking pretty good so far !! thanks for the advice and honest practical advice on here . Hi Rob, it’s great to hear from you with a follow-up! It just shows, when you play to people’s strengths, you get more out of them and people seem to enjoy it more too! Really appreciate you getting back to us with this. Hi my son plays in a mixed ability junior sevens team , he usually plays left back and is comfortable receiving the ball from the goal keeper and moving the ball up to the midfield , however in the last few games he has not seen much of the ball but stays back and holds his shape very well , possibly too much , he seems pretty disciplined at understanding he is last man so sometimes gets little out of the game so comes away frustrated , the coach plays a fairly rigid 2 2 2 so any ideas how he can get more of the ball and be involved more ? Hi Rob. I don’t want to be too negative about your son’s sevens team, but if he’s really young and they’re playing him as a defender every game, I don’t believe that’s ideal from a development perspective. How can a young kid be labelled as a defender and be asked to stay back the whole time whilst everyone else participates the forward play? It’s my belief that kids should experience playing a variety of positions over the season. Ok, he may be more naturally defensively inclined and play more games in defense, but I don’t like them being fixed to a position too young. I think it may be worth speaking to the coach, and asking if there are ways he can be more involved in the attacking play. Be it trying a new position, or just being given more license to roam forward. If he values your son then I think he’ll find a way. Another thing you could do is show some examples to your son of some famous players who played defensively, but also were a threat going forward. I’m sure there’s footage of Dani Alavez, Marcelo, etc that you could show him on YouTube – they are defenders who go forward. Pique, Ramos, John Stones – they all are comfortable on the ball and can pass it around. However, if the coach isn’t going to change the way he picks positions then there isn’t much you can do – short of trying another team. Totally agree with this. If the coach is doing his/her job correctly, then they have enjoyment and development at the forefront of their mind when making decisions like team selection. All the children should be experiencing different positions and asked to perform different roles, so long as they know what they are doing and why they are doing it. Also, definitely show examples of defenders contributing to the attack whilst balancing their main responsibility. It’s no coincidence that some of the most renowned ‘minds’ in the game were defenders as players. It’s a position that demands intelligence. First things first, thanks for uploading this article! I’m sure it has helped a lot of coaches and players! The reason why I’m writing a message, is because I’m curious to hear your opinion on the experience I have had with my team. This is my third year coaching an U11’s, they play 7 vs 7. I’m coaching a pretty good team, every player understands the principals of football. I live in the Netherlands and I guess you know we like to play possession-based football out here. For this reason, I tried to play a couple games in the 1-2-3-1 formation in the beginning of the season. In training, it went pretty good, the defenders and midfielders could keep possession for a relatively long time and could create chances. The problem I experienced during the matches, is that our wide midfielders, had to run too much. They are used to play like wingers, so almost ever time they receive the ball, they dribble at their oponnent and make an action. They’re really fast and have a good technique, so that’s not a problem. But when they lose the ball, they have to run back to our own goal, because they have to defend as well. After 15 minutes or so, they are completely exhausted and their dribbles won’t be as effective as if they are fit. Because the strong points of my wide midfielders aren’t defending, I think this formation is not the right one. After these games, I switched to the 1-3-1-2. My wingers were my attackers now. I said they should stay in the middle of the field, so they could run into the gaps. Also I said that they could change positions sometimes, so the opponents would be confused. My centre (only) midfielder had to drop next to the central defender if the goalkeeper had te ball and he wasn’t able to play to the midfielder. The bottom line is that he just had to look for space. Because we were playing with 3 defenders, our attackers and midfielder hadn’t to run over the whole field and could concentrate on their attacking tasks. I think the 1-3-1-2 is one of the best ‘basic’ formations. Defensive-wise, it is really reliable bacause of the 3 defenders + midfieder and offensive-wise, the attackers can do their thing and keep energy to hurt the opponent. Do you think I’ve done right changing formation after hearing this, or do you think I should have sticked to the 1-2-3-1? Yes Piet, you have done the right thing. The right thing is to think about the issues and to experiment with solutions. You will soon know if the idea has worked, and if not you can always go back to how it was. But in experimenting, you will develop ideas, and importantly you’ll develop as a coach. I also believe that your players will be better, for having a coach who is prepared to trial different tactical solutions – provided it is done in an organised way. On the specific change you made. It sounds like the switch to the 3-1-2 is backed by some good rationale for the system you’re playing. One thought though: are your three defenders now separated from the attacking unit? It sounds like you might have divided the group into an attacking unit and a defensive unit. Whilst it might work well, is that best for their development? I don’t know, I’m just questioning. That sort of attack is very hard to defend against. When teams run at you in numbers, in an unpredictable way, it’s hard to set up defense. Thanks for sharing your way of doing it and glad it’s working for you. Thanks Ronnie, that sounds like a decent way of playing. hi gaffer. for my birthday I am having a 7 a side football game vs my brothers team on a astro turf pitch. my team has skill and pace but we are lacking defense a bit. could you suggest a formation for my team which will help me with both. thank you. Hi Moey, firstly congratulations on picking a great way to spend your birthday. Perhaps you could use something like a 2-3-1. If you have pace and stamina then you can have the midfield 3 working back on defense to be a really strong unit. Another option for you could be the 2-1-2-1, which would give you defensive cover at the back, but also allow you a defensive midfielder to drop back into the defense for extra cover. The main thing is that everyone has an attitude that you defend as a team, and when you lose the ball you work back. I could suggest playing with 7 defenders, but if none of them wanted to be defenders and didn’t work back when the ball had been lost, the defense would still be rubbish! It’s got a lot to do with picking the right players for the job, and developing a mindset that defending happens as a team. Good luck. thank you so much. could you also send me some pre match tactics. thank you again. Yeah, I can do. But what sort of thing do you mean? The issue of having loads of forwards is a common one. Look at their individual skills and their tactical discipline and try to build a team from them. Also ask them where they want to play, as they’ll realise they can’t all play up front. As to training drills, if you’ve got time then anything fitness related will help. You can practice skills individually with a ball, but the best way – certainly the most fun – is to practice by playing lots of games. This 2-3-1 formation is what our team need to adopt. How should we pay against a team that plays slowly, passing and moving around, looking for spaces and exploiting defender’s weakness in order to score? Hi Akgigyani, I’m glad the article helped. It sounds like difficult opponents there if they’re passing around and waiting for the right moment to strike – only teams that are comfortable on the ball can play that way! There are really only two ways to go: either press them and try to break the passing rythm, or sit back and resolutely soak up the pressure before launching a counter attack. I don’t know which will suit your team better because I don’t know your players. But I will say that pressing only works if people know how to do it and it’s done as a team, with discipline. So I’d be tempted to go with the other strategy (unless you’re confident in pressing) of sitting back, defending the important areas near your goal and then hitting them on the counter. Hope that helps. When playing 7 a side at the u18 level, I employ a different formation in the attacking and defending phases of play like those suggested in the “advanced tactics” section, but I look to rotate in the opposite way. We defend in a 2-3-1 that lets us press high up the pitch with 4 players and win the ball back quickly, but when we transition into attack, the central midfielder drops between the backs allowing the backs to provide width and the other midfielders into the center of the pitch. I really like 2-3-1 as a defensive shape because it allows us to press high up the pitch, but I don’t like it as an attacking shape because they two backs have to stay back almost exclusively which means the opposition only have to worry about defending 4 players. Conversely, The 3-2-1 allows any of the backs to join the attack while the others cover meaning all 6 field players have an opportunity to get involved going forward meaning the opposition need to be wary of everyone. The 3-2-1, however, struggles to press high up pitch with only 3 players free to engage. The base system is essentially like the 2-1-2-1 but is highly fluid with the players who play as the ‘2-1’ in the ‘3-2-1’ allowed to interchange in attack and then naturally fall back into any of the their 3 defensive positions when the ball is lost based on where they end up when attacks break down. As the front 3 players roam around the pitch, it is up to the ‘3’ to balance the movements of the ‘2-1’. If the front players overload one side of the pitch, the back on the far side will push up to provide balance while the defensive midfielder and near side back provide cover. If the ‘2-1’ are covering the width of the pitch well, the defensive midfielder might step forward and provide an option to switch the point of attack while the backs provide cover. Sweeper Keeper: Along with fulfilling typical goalkeeping duties, 7 a side keepers take on a much greater responsibility in starting attacks with their feet than 11 a side keepers. 7 a side plays much closer in style to 5 a side than it does 11 a side. It is critical they form a diamond with the two defenders and defensive midfielder to initiate early build up by forming a rondo around the opposition’s initial press. Defenders (x2): Exceptional athleticism is most important. They need the strength and ball-winning ability of a traditional center back along with the pace and stamina to provide width when the opportunity arises. More pace means a higher defensive line and a more aggressive starting position on the wing because of the recovery speed. Ability on the ball is still important for initiating attacks, but they should usually be in space when we are in possession. If they are being closed down quickly, the team shape is poor or the opposition are pressing so dangerously high that we must have 1v1 opportunities up front to play directly into. Defensive Midfielder: This player functions as the team’s pivot and is the most important player on the pitch for playing possession football. They initiate attacks and form triangles with teammates to allow ball retention and circulation while balancing the movement of the other 5 field players. More than anything else, this player needs to be an intelligent reader of the game who enjoys doing the simple things exceptionally well. We don’t need him to get assists or make last ditch tackles. We need him to close down dangerous space before the opponents can exploit it and find space in possession to allow the team to keep the ball. Attackers (x3): Versatile attacking players work best here. The front three need to link up and interchange as much as possible while the back three provide balance when the pitch is overloaded in one area. Generally, you would want three attacking midfielder/deep lying forward type players but less versatile strikers and wingers can offer a more one dimensional option if that is what your squad has available. If 2 of the three players are specialists however, the attack can get really static as the third player has nobody to interchange with regardless of how versatile he is so playing a target man and a winger (or 2 wingers) at the same time can be really limiting. The more one-dimensional the attackers are, the fewer of the back three can get involved in attacking. (example: if the right wing player stay on the touch line almost exclusively, the right back is always forced into a cover position and never gets to overlap while the defensive midfielder and left back have opportunities to join the attack and the advantage of attacking with all 6 players is lost.) The front three don’t always drop into the same covering positions in the defensive phase. If the nominal forward pulls left and the left player makes a run through the center, the forward may defend from the left when the ball is lost while the midfielder takes up his position pressing from the front. Wow, I can’t believe the detail that’s gone into this one. That’s going to be so helpful for others to read – thank you for sharing that! This is my first year coaching kids old enough to play 7 a side, I have been using a 3-1-2. I have to do this because I have two well below average players who I make my wing backs. Their only job is to funnel attackers to the outside and force them into mistakes. My CB is a great natural sweeper and does well in that role. I have several very attack minded players so I play two of them as forwards and one as a midfield with responsibilities on both sides of the pitch. Thinking about going to an outright 3-3 though and having the attacking players play with a center forward and two wings. I would suggest 3 1 2 defending. Would you suggest a 1-4-1 with sort of a target man striker and then the wide midfielders coming in a bit as sort of second forwards to support him then the two Cms can sit behind them to and try dictate play while the Centre back remains free to just thwart any attacks or open up the opposition from the back himself? Hi Jeremy, I think this could work if you have quite an adaptable, tactically aware midfield. And also a very good, quick defender. You’re asking the 1 at the back to do a lot of work there, so he’ll need a lot of support from the midfielder, especially if you come up against a strong team that are pushing more than one player beyond your midfield 4. I think it could work, but as with all these formations, it’s making sure that you have the players to really make them a success. Good luck! Am just gathering a team of people i barely know for a 7 a side competition by ending of this month and i have little time to know their strengths and weaknesses.. What formation can be best prescribed for me…nice football article..good for inspiring professional coaches looks us out there.. I always like to try to fit the formation to suit the players, but given that you’ve got no time to work out what your players are like, that is going to be difficult. If it’s a team that’s just been thrown together then I suspect that you might struggle with tactical discipline, and I’d worry a little about players just deciding to go forward and not come back to help with the defense. So I’d be minded to pick a slightly defensive set-up, possibly the 3-1-2, or maybe a 2-3-1 with a holding midfielder. People will probably naturally want to attack, but if you’re finding it too defensive then you can start letting them off the leash by pushing an extra player forward. Hope that helps. i used the 3-2-1 formation and it did show gud results,but our next match is against a really strong team,have u got any formation which will help us get across the half-court without losing possesion as well as not putting any pressure on the defence, coz’ our defense is kinda slow. Can i use 1-2-1-2 formation.with 2 defensive mids,1 defender and 1 attacking midfielder and 2 strikers. Hi there. Yeah, you can definitely give evidence that formation a try, but I’d just have a think about why you’re playing two strikers against a very strong team. I might expect, in this case, that they will be attacking you a lot, and if your strikers don’t work back, this could make it difficult. Also, with only 1 dedicated defender that might be tough. Maybe a 1-3-1-1 might be better? It’s very similar to what you suggested, but offers a bit more defensive cover. If you need an extra target in attack you can always shuffle your attacking midfielder up a little more. Just a thought – hope it helps. My team mostly playing 3-3-0 and I feel we are very connected in both attack and defense. Is it a uncommon tactics since you didn’t mention here? It’s unusual to play with no strikers, but if you have enough midfielders who are capable of pushing forward then it can be really effective . You’ve missed out the 3-1-2. Strikers aren’t needed in small sided football so this formation works as you have two fullbacks and two wingers (in the way Ronaldo is a winger) meaning that four of your outfielders play out wide where the space is. In addition, you have one centre back and one centre mid. No one shares a position so the left back is in sole charge of that role and its responsibilities, allowing for greater opportunity to develop, especially at youth level. The individuality of the players bring the formation to life. One season, my right back was a player who would have suited CAM in 11aside. At right back, he had the space to run with the ball and attack but the opposition struggled to track him from such a deep position. His 30 goals in 13 games was evidence of this tactical success. I partly agree with your comment about strikers not being needed in small sided football. Players who are all-out strikers and don’t do any defending are definitely people that would be very diffcult to carry, but it sounds like we’re saying the same thing. You do of course need to make sure that you’ve got enough numbers when you’re attacking – teams usually need to attack in numbers of at least 3, and your wingers strategy seems to do this. Thanks for posting yet another good, alternative strategy. Hopefully others will give it a try. Hey Gaffer,This is a great article and it’s also helpful. I want to know what is the best possible way to stop a Team which is Fast,Skilled,Deep in defense and Active in offense?. Our Team is the weakest out there right now.Our only strength is 2 good midfield players with strength and stamina. Hi Essa, that’s really tough! The team you have described playing against sounds like the complete package. The best way to go is to exploit opposition weaknesses, and to play to your own strengths. Perhaps a 3-2-1 is the way for you to go. The midfielders can do a bit of everything, so why not give them a solid defensive base that they can play infront of? That way they can be more free to help the attacker. Hi Gamst, sorry to hear that you had such a tough game. It’s always going to be difficult if the opposition are ahead of you in terms of either skill or stamina – both are such important attributes to winning the game. Luckily, it sounds like it’s just the fitness that’s the issue here, and this can be improved over time of course. In the short-term, you could experiment with a few different tactics. Here’s one that might work for you. Try playing a 3-1-2. It’s not a formation that I’d often suggest but it might play to a few of your strengths. You say you have two good strikers and this will free them up to cause problems against the opposition and allow you to counter-attack. With 3 at the back, you should always have defensive cover, even if one of the 3 goes forward to support the attack. I’d keep that defensive 3 fairly narrow so that you’re not being taken on down the wings where you don’t have the speed or stamina. Then you’ve got the midfielder who is your one player who does have the lungs to get up and down the pitch. He’s the link between your defensive unit and your attacking two – a lot will depend on his ability to play box-to-box, helping the strikers whilst also being able to drop back in and make a compact defensive unit when you haven’t got the ball. Just a thought – let me know what ends up working for you. 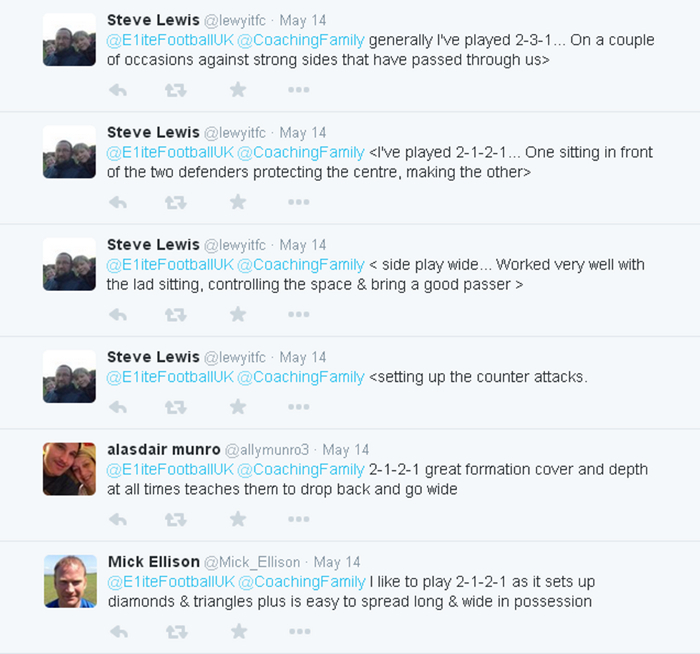 This is really good, I’m a coach mentor foe the FA and I will share these with the coaches I work with. I will also share the link to your website. Have you got anything on 9v9 and 11v11? thanks John Phelan. 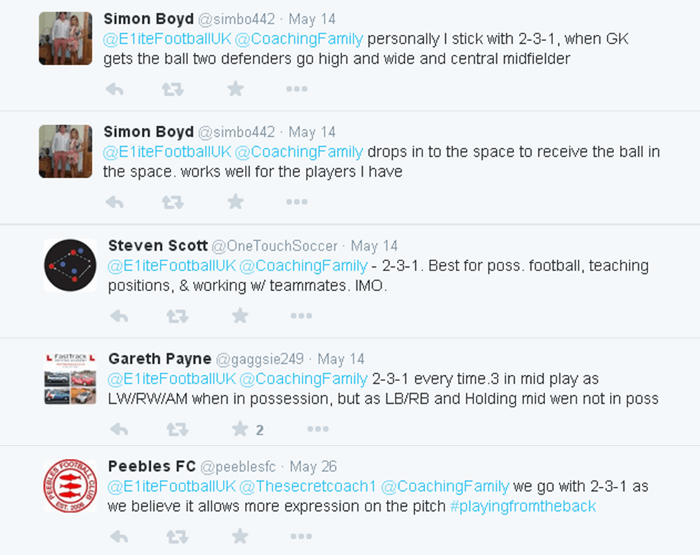 Really good to see coaches sharing what they know passing on their knowledge. it will be a massive help to some of the coaches i work with also the girls football team at work thanks again John. Hi Matt, it’s coming soon – due to popular demand. Another well constructed article. Thanks. PS Any chance of getting Spurs to use any sort of recognisable tactic in 11 a side? Paul, I’m happy to help, but I’d need to be a magician to sort out the spurs!